ASHBURN, Virginia -- Adrian Peterson tested history earlier in his career, tearing his ACL in 2011 only to rush for more than 2,000 yards the following season. He’s testing it again, trying to prove he can still be an effective every-down back at age 33. The Redskins signed Peterson on Monday and haven’t guaranteed him a roster spot, let alone the starting job. But they raved about his workout and teammates said he looked sharp in practice. What that means for Week 3, if he’s on the roster, is anyone’s guess. Of the nine modern-era Hall of Fame running backs who played until they were 33 or older, four rushed for at least 703 yards – and one for 1,000. Some were effective for a few more years; others were not. Peterson might be in better shape than all of them; he’s also had two serious leg injuries. What can the Redskins expect from 33-year-old Adrian Peterson? History suggests a mixed bag. * Strike shortened season to 9 games. The average for these backs at age 33: 11.2 games, 146.2 carries, 574 yards and 4.8 touchdowns. Emmitt Smith (retired at 35): Smith’s last 1,000-yard season occurred at age 32 when he averaged 3.9 yards per carry for Dallas. But in his final two seasons, with Arizona, he averaged 2.8 and 3.5 yards, respectively, and gained a combined 1,193 yards. He did rush for nine touchdowns in his last season. Walter Payton (33): At 32, he still rushed for 1,333 yards (and finished with 1,715 yards from scrimmage). Like Peterson, he was a workout freak. But he also was more durable in his career, having not missed a game from his second year until he retired. In his final season, Payton split time with Neal Anderson and rushed for 533 yards while catching 33 passes for 217 yards. Jerome Bettis (33): At 32, he rushed for 941 yards and 13 touchdowns, averaging 3.8 yards per carry -- his career average was 3.9. But at 33, Bettis managed 368 yards rushing during the regular season, with 9.2 carries per game. In the postseason, he helped the Steelers win a Super Bowl and averaged 14 carries per game. His yards-per-carry wasn’t great: 3.2 in the regular season; 3.3 in the playoffs. But he was effective closing out games. He retired after the season. Eric Dickerson (33): He made his name first with the Los Angeles Rams and then, after a trade, with the Indianapolis Colts. But he spent his last two seasons with the Raiders and then Atlanta. There were glimpses of the old Dickerson, twice rushing for more than 100 yards with the Raiders. He split time with Marcus Allen and led the team with 729 yards rushing. But they traded him to the Falcons after the season. After four games and 91 yards in a backup role, they traded him to Green Bay. Dickerson failed a physical and retired. Tony Dorsett (34): He rushed for 1,307 yards at age 31, but never topped 748 in his final three seasons. 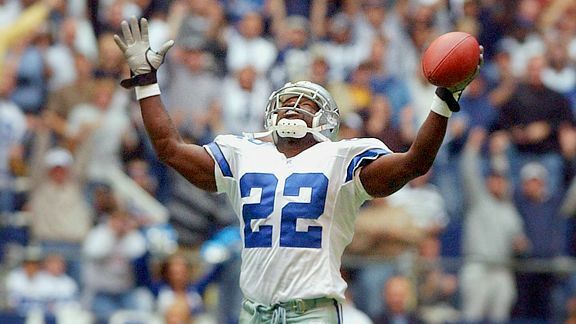 The Cowboys traded him to Denver for his final year, where he rushed for 703 yards and averaged 3.9 yards per carry. There were reports of him running the 40-yard dash in 4.38 seconds before his final camp. And Broncos coach Dan Reeves, who once coached him in Dallas, said, "I haven't been with him for seven years, but I don't see any loss of quickness or speed. He seems to have all those things he had when he came into the league." Marcus Allen (37): Allen only surpassed 1,000 yards rushing three times in his career, the last coming when he was 25. But he was a versatile back, thanks to his pass-catching and blocking ability. At age 32, he only rushed for 301 yards in his final year with the Los Angeles Raiders. But at 33 he won the NFL’s Comeback Player of the Year award the next season with Kansas City. He led the Chiefs in rushing the next four seasons, though never topping 890. He did average 4.0 yards per carry. He also caught 141 passes with the Chiefs. At age 37, in his fifth season with Kansas City, he rushed for 505 yards. Franco Harris (34): In his final season with Pittsburgh, Harris rushed for 1,007 yards on 3.6 yards per carry and five touchdowns. But in the ensuing camp, Harris held out for more money, and the Steelers eventually cut him. He signed with Seattle, only 363 yards from becoming the NFL’s all-time leading rusher. Harris flopped in eight games with the Seahawks, managing 170 yards and 2.5 yards per run. He was cut and never played again. Thurman Thomas (34): He rushed for 1,033 yards at age 30 before starting a steady decline. He gained 1,176 yards rushing in the ensuing three years combined with Buffalo, before the Bills cut him at age 33. He signed with Miami and in nine games rushed for 136 yards before a knee injury ended his season -- and career.